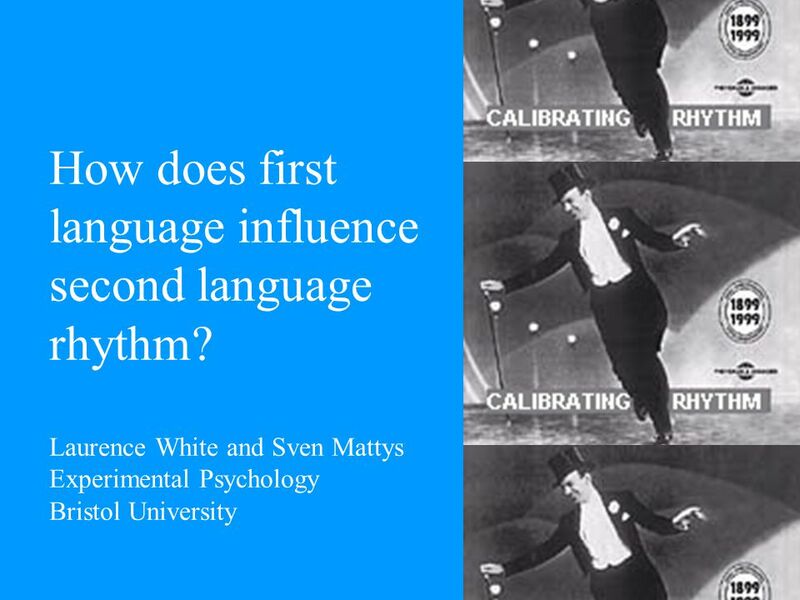 How does first language influence second language rhythm? Laurence White and Sven Mattys Experimental Psychology Bristol University. 2 Overview Background:  Speech rhythm and “rhythm classes”.  New speech rhythm metrics. 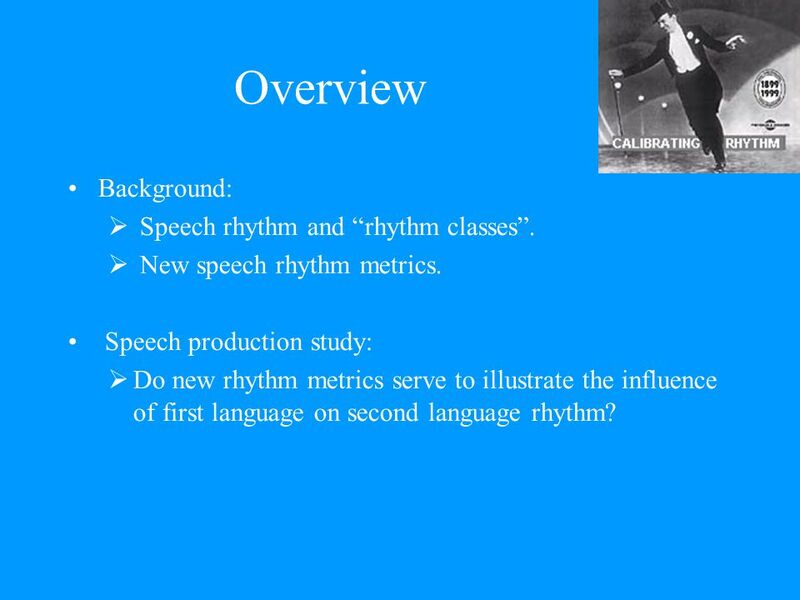 Speech production study:  Do new rhythm metrics serve to illustrate the influence of first language on second language rhythm? 4 Stress-timing vs syllable-timing Stress-timed languages: isochrony? sleep.ing. soundly vs sleep.il.y. 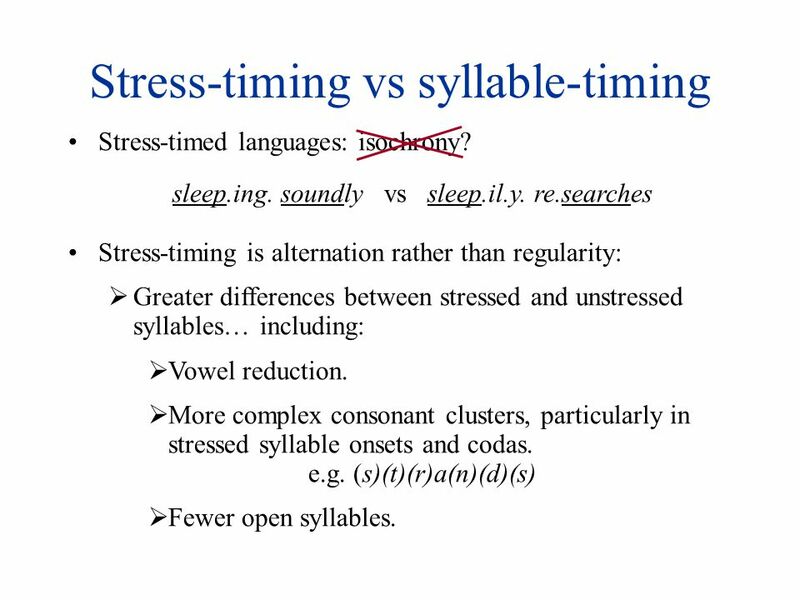 re.searches Stress-timing is alternation rather than regularity:  Greater differences between stressed and unstressed syllables… including:  Vowel reduction.  More complex consonant clusters, particularly in stressed syllable onsets and codas. e.g. (s)(t)(r)a(n)(d)(s)  Fewer open syllables. 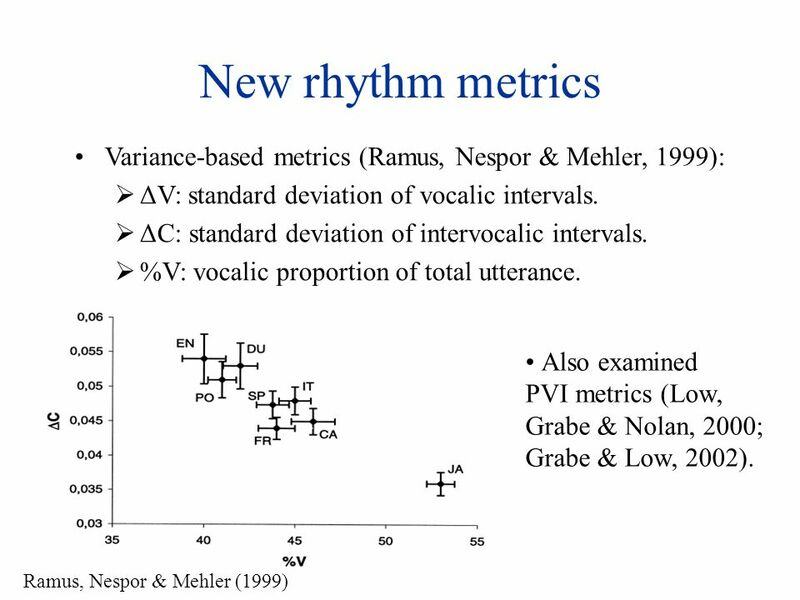 6 New rhythm metrics Variance-based metrics (Ramus, Nespor & Mehler, 1999):  ΔV: standard deviation of vocalic intervals.  ΔC: standard deviation of intervocalic intervals.  %V: vocalic proportion of total utterance. Ramus, Nespor & Mehler (1999) Also examined PVI metrics (Low, Grabe & Nolan, 2000; Grabe & Low, 2002). 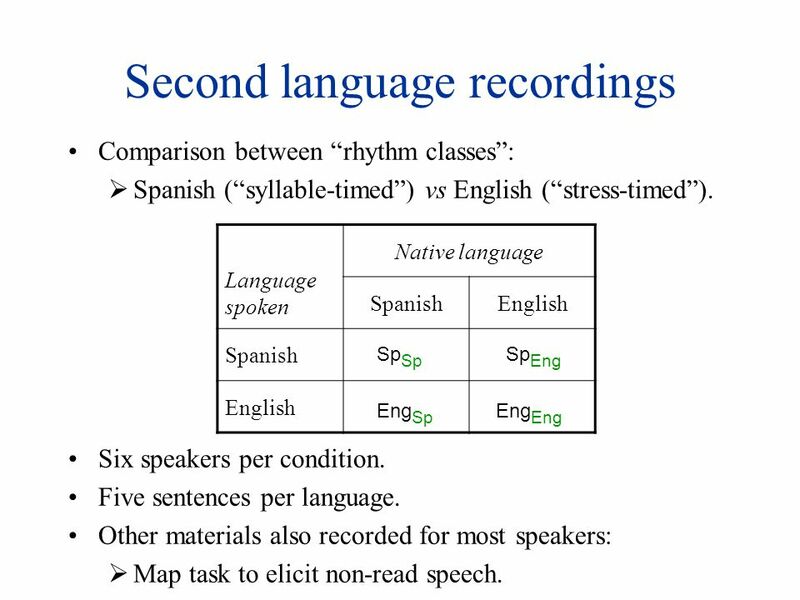 7 Overview Background:  Speech rhythm and “rhythm classes”.  New speech rhythm metrics. 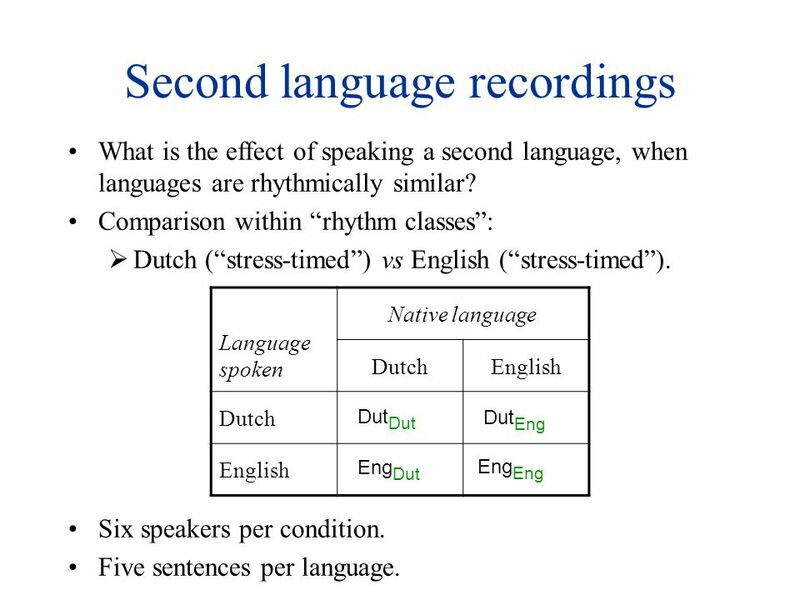 Speech production study:  Do new rhythm metrics serve to illustrate the influence of first language on second language rhythm? 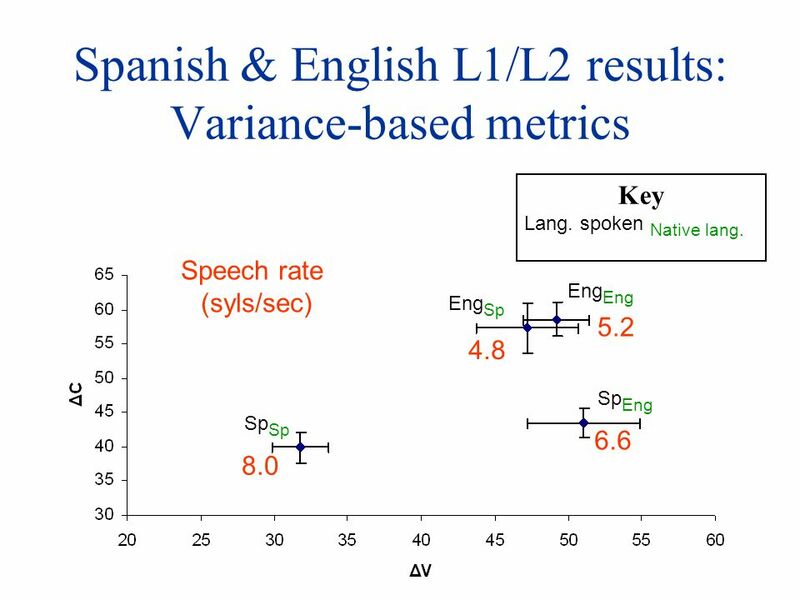 9 Spanish & English L1/L2 results: Variance-based metrics 8.0 6.6 5.2 4.8 Speech rate (syls/sec) Eng Eng Sp Sp Sp Eng Key Lang. spoken Native lang. 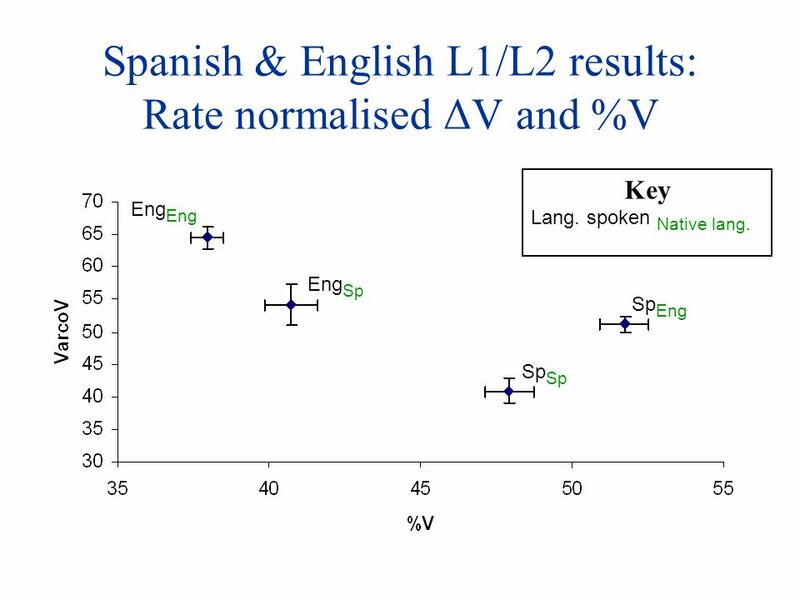 11 Spanish & English L1/L2 results: Rate normalised ΔV and %V Eng Eng Sp Sp Sp Eng Key Lang. spoken Native lang. 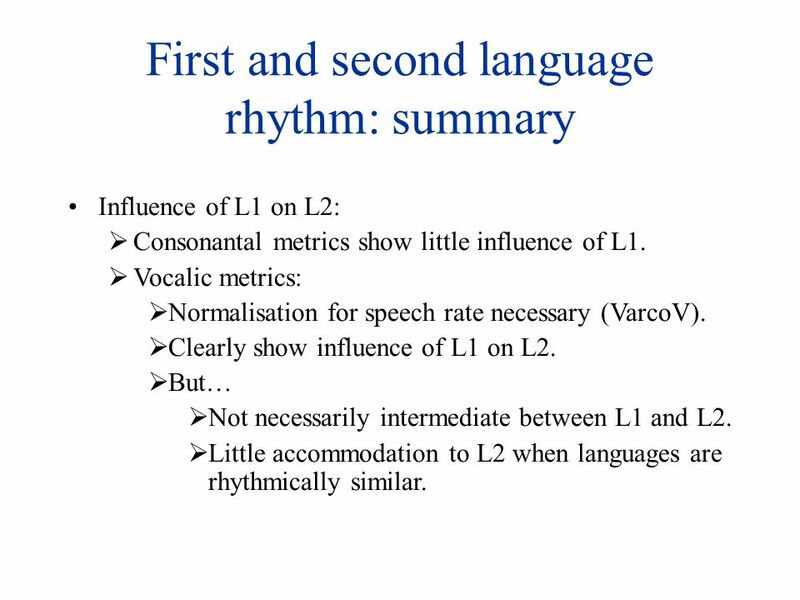 15 First and second language rhythm: summary Influence of L1 on L2:  Consonantal metrics show little influence of L1. 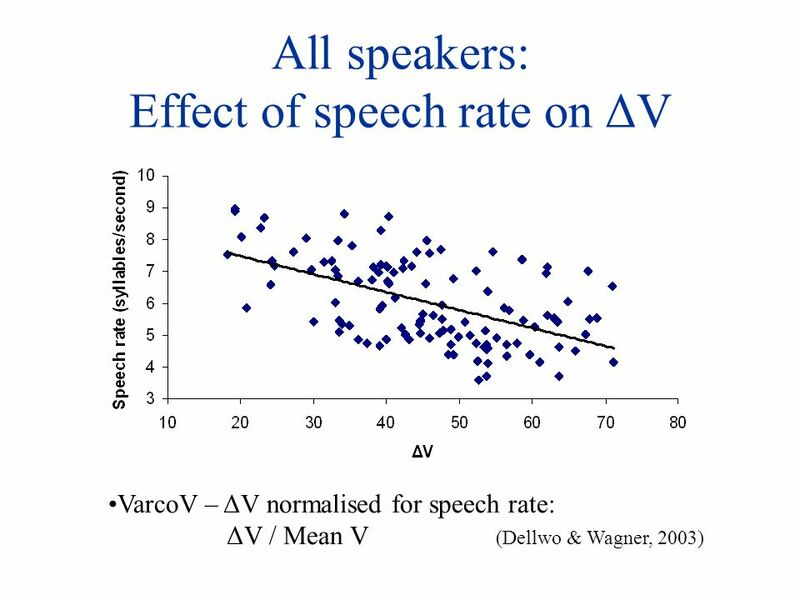  Vocalic metrics:  Normalisation for speech rate necessary (VarcoV).  Clearly show influence of L1 on L2.  But…  Not necessarily intermediate between L1 and L2.  Little accommodation to L2 when languages are rhythmically similar. 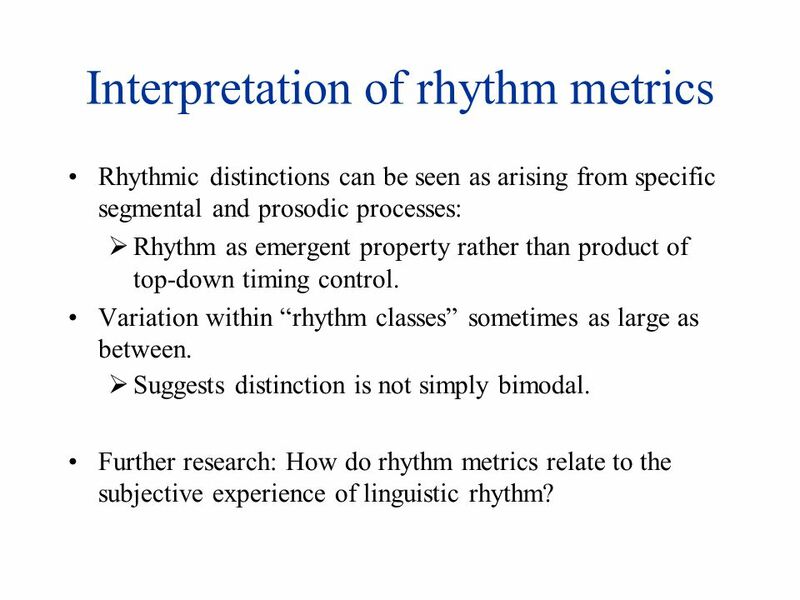 16 Interpretation of rhythm metrics Rhythmic distinctions can be seen as arising from specific segmental and prosodic processes:  Rhythm as emergent property rather than product of top-down timing control. Variation within “rhythm classes” sometimes as large as between.  Suggests distinction is not simply bimodal. 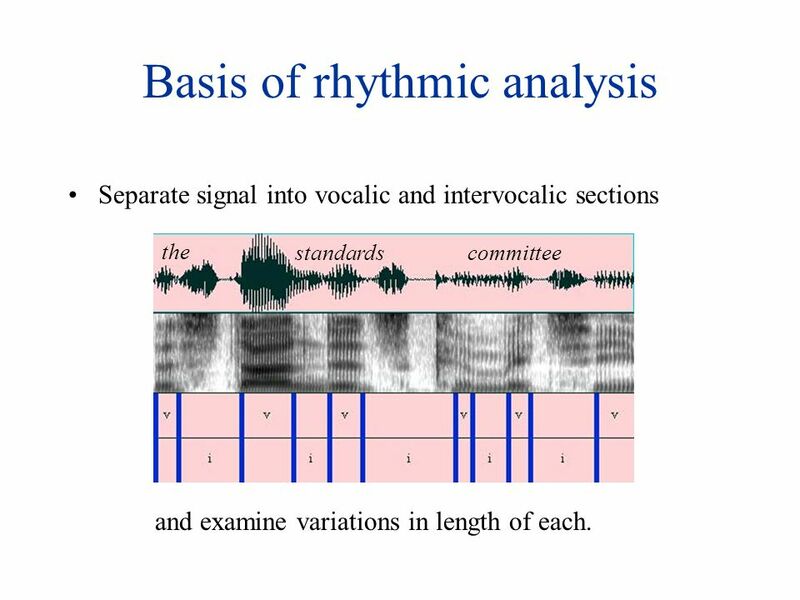 Further research: How do rhythm metrics relate to the subjective experience of linguistic rhythm? 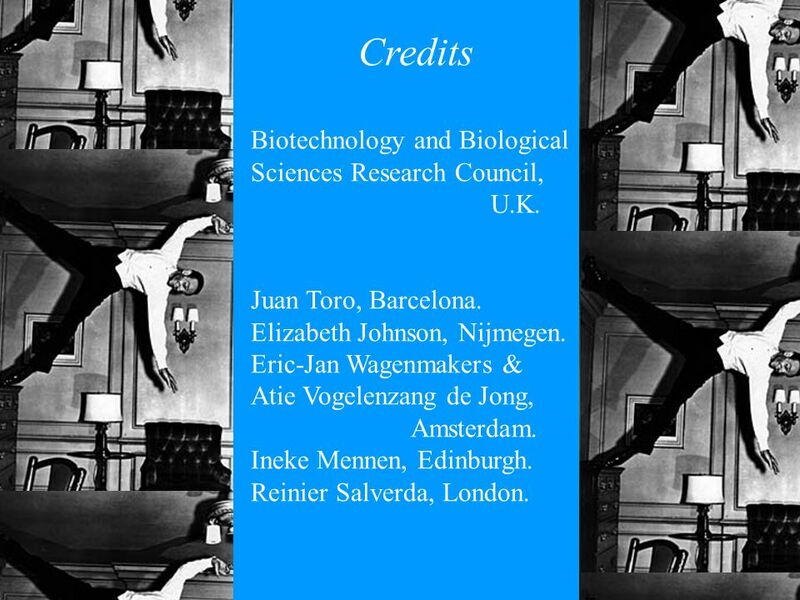 17 Credits Biotechnology and Biological Sciences Research Council, U.K. Juan Toro, Barcelona. Elizabeth Johnson, Nijmegen. Eric-Jan Wagenmakers & Atie Vogelenzang de Jong, Amsterdam. Ineke Mennen, Edinburgh. Reinier Salverda, London. 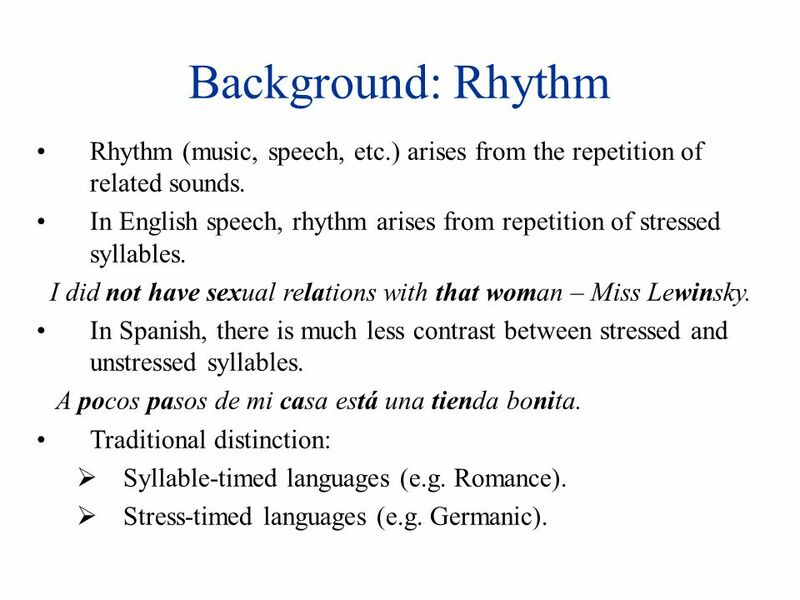 Download ppt "How does first language influence second language rhythm? Laurence White and Sven Mattys Experimental Psychology Bristol University." Function words are often reduced or even deleted in casual conversation (Fig. 1). Pairs may neutralize: he’s/he was, we’re/we were What sources of information. 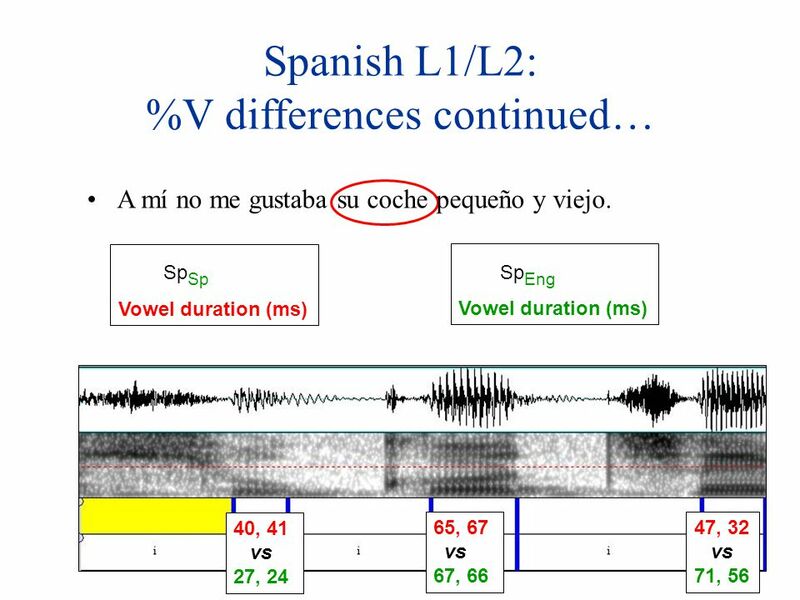 Phonetic variability of the Greek rhotic sound Mary Baltazani University of Ioannina, Greece  Rhotics exhibit considerable phonetic variety cross-linguistically. Scienze e tecniche psicologiche a.a SENTENCE STRESS. Nigerian English prosody Sociolinguistics: Varieties of English Class 8. EP and BP Rhythm: Acoustic and Perceptual Evidence Sónia Frota Universidade de Lisboa Marina Vigário, Fernando Martins. A cross-linguistic comparison of the coordination between hand gestures and phonological prominence Giorgos Tserdanelis. 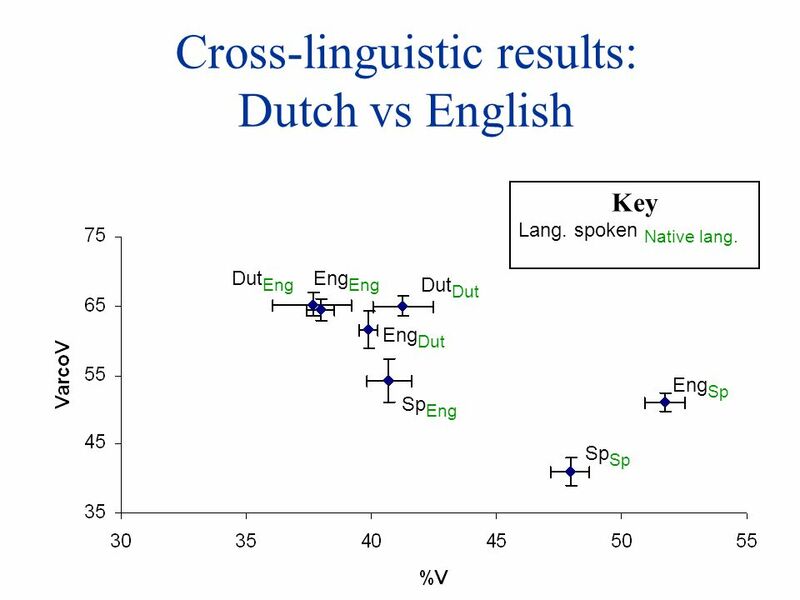 Perception of syllable prominence by listeners with and without competence in the tested language Anders Eriksson 1, Esther Grabe 2 & Hartmut Traunmüller. : Recognition Speech Segmentation Speech activity detection Vowel detection Duration parameters extraction Intonation parameters extraction German Italian. Suprasegmental features and Prosody Lect 6A&B LING1005/6105.